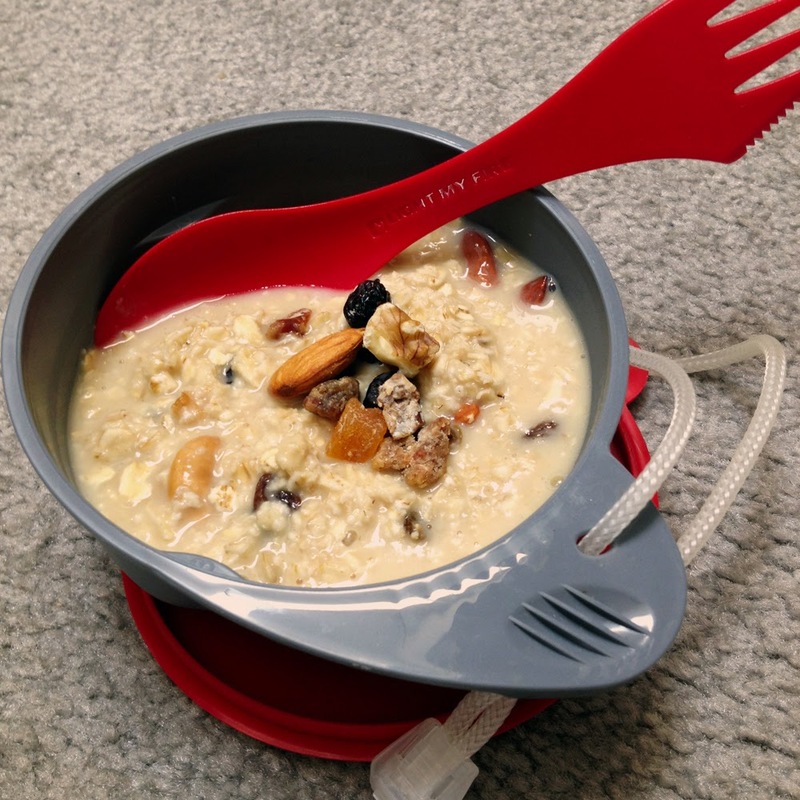 * Wild About Porridge *: Porridge on the go! Spring is here and summer is on the way and porridge needs are changing with the seasons. I will be doing a bit of traveling and camping, and I hope to be able to share some of the recipes that can be good to have on the go. Just last weekend I found myself in a car, driving down to Portland for a mini-holiday, and while I'm a big fan of picking up a muffin on the go AND of having great meals out when travelling, every now and then I just want something simple and warm - like, you guessed right, porridge. Having porridge on the go is much easier than it sounds. I had a camping mug and spoon with me on the trip and thats' pretty much all you need, the rest you can pick up in a supermarket on the way. Here's a quick tip for getting an easy, healthy meal wherever, whenever. If you're in a hotel, you're likely to have a kettle in the room to boil water. If you don't (which was what happened during this trip), all you need to do is stop by a coffee-shop or restaurant and kindly ask for some hot water for your mug. Mix in the instant oats and a small pinch of salt and let stand for a couple of minutes, covering it with your hand or a guidebook or whatever you have lying around in the car or your pack. 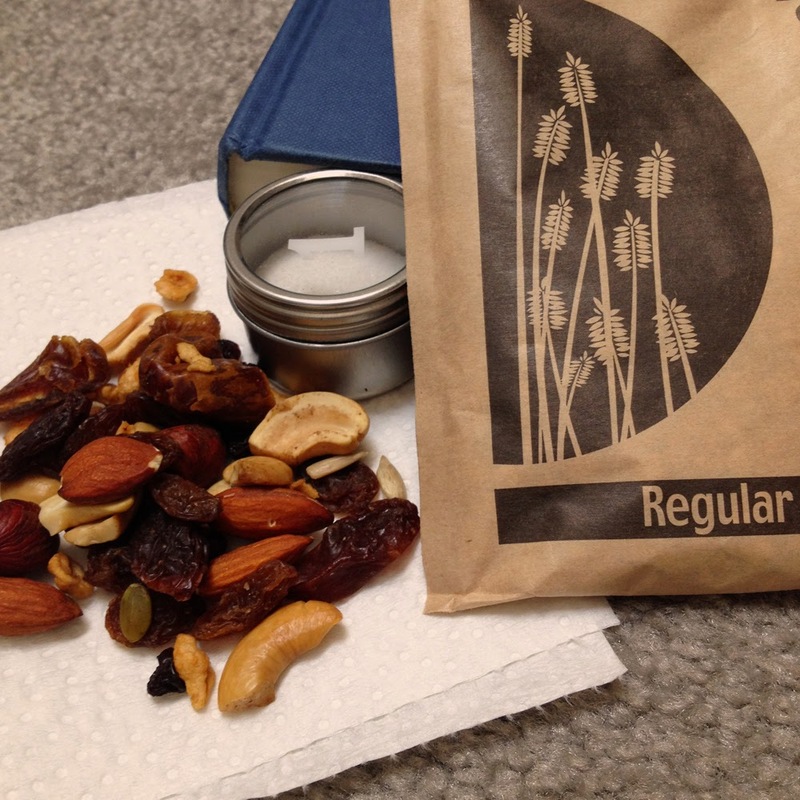 Add the trailmix and enjoy! Of course you can add fresh berries, some banana or anything else you can easily pick up int a store along the way, but the trailmix and instant porridge are both dry and easy to store, whereas other ingredients would need to go into a coolbox if you don't want to use them all at once. Now I didn't actually have any salt with me this time and it bugged me a bit because without that tiny bit of salt you don't get the balance and contrast between the porridge and the trailmix, or any other sweet things you might add to your porridge. When I got back home I dug out a little tin I got once as a taster package of tea, and filled it with salt. It's the perfect size to pack for travel, so from now on I'll be okay. Something I've done before is also to keep the little salt packages you get in fast food restaurants, but they wear out and tend to break in your bag at some point. Also, they can't be resealed so it's always all or nothing. In the next couple of weeks I'll be making my own instant porridge mixes. I'm not a big fan of the ready mixes you can buy in the store, as they're usually drowned in sugar and all kinds of unnecessary added ingredients. It's still great to have ready made mixes that you can just add water to, so stay tuned for some ideas, and if you have any good tips for porridge on the go please share them by commenting below!